There are many reasons why conversations may need to be recorded, and using the latest technology will allow users to do so with convenience and speed. 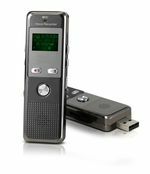 With our audio recorders you can record phone or room conversations. A lot of people use audio recorders including: suspecting spouses, employers, students, sales people, private investigators. Our digital phone/room recorders eliminate the need for cassette tapes and tape flipping. Digital recordings can be played, replayed and recorded over without a loss in recording quality. Digital phone/room recorders are silent because there are no running tapes. Some recorders have a USB port for connection to your computer. Whatever your audio recording need is, I'm sure you'll be able to find one of our phone/room recorders helpful. This plain looking Audio Recorder is guaranteed to never draw attention to itself while it captures everything it hears. This gadget is the best of it's kind on the market today and is great to use for gathering evidence for covert missions. 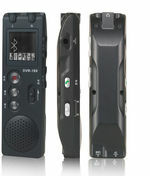 The VR4GBPro is a professional grade telephone and cellphone voice recording device. This device even includes dual microphones and noise reduction for crisp and clear audio recording. Plug this little wonder into a wall jack, pick the recording quality mode that suits the situation. The MiniDV-Voice unit features not only the ability to hold up to 75 hours of audio recordings but with its attached camera it takes color video and still images, it can even function as a web cam! 180 Hour Voice Recording Watch is a Portable and user friendly, Patented MP3 watch.